Round Table: "Here Comes the Flood"
1. What was your favorite Grey's Anatomy quote from the episode? McCritic: The way Cristina described speaking to Derek. We love the McDreamy one, but we sometimes love Cristina's brutal honesty even more: "Well there's pain and then there's torture." missingBurke: A tie between 1. Cristina's dismissive [to Lexie] "Don't think. Know." and 2. Mark's [to Callie] "You want a spanking?" So funny! iheartizzie: I confess, the softer side of Alex Karev appeals to my inner cheeseball. When he was explaining to the man how his pancreatic cancer was discovered at Stage One, and how his luck has turned around, he nearly brought a tear to my eye. 2. Will George pass his internship test? iheartizzie: I hope so. The results of our George and Lexie poll are mixed, but I actually think they'd be a great couple. If she helps him earn a second shot at the text and then pass it, romantic fireworks can't be too far off, can they? McCritic: Yes. As much as I love the Chief, it can't be good for George's career to remain his intern forever. missingBurke: He has to. As he said, he's not married and cheating on his wife with his best friend this time. You're golden, O'Malley. 3. Should Izzie and Alex move out? missingBurke: No. Derek might have objections, but I like the residents all living in the same house together. It's perfect for such a coming-of-age drama. McCritic: Yes. It's only fair to Derek and Meredith. But, please, don't move in together, guys! Sexual tension between roommates is a recipe for disaster. iheartizzie: Yes, as long as they move in together. Not only would that lead to great comedic exchanges, maybe Alex's parade of skanks would cease and he'd sweep Izzie off her feet! Eh, probably not. But if nothing else he should do it for the baked goods. 4. Mark Sloan: A great TV character, or the greatest TV character? McCritic: With apologies to George Costanza and Andy Sipowicz, Mark Sloan may be the greatest. Those one-liners, combined with that sly smirk when he delivers them, give Sarah Palin a run for her adorable money. iheartizzie: He'd have to play a more central role to be the greatest, but Mark is up there. 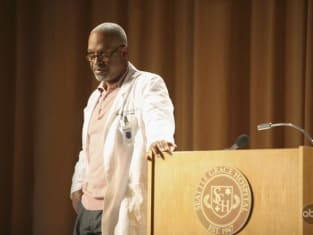 The writers get major props for his transition from Addison's male madam (I don't even know what that means) to wise-cracking, not-entirely-mean-spirited surgeon. missingBurke: Just a great TV character. Have you met Brian the Dog from Family Guy?!? 5. 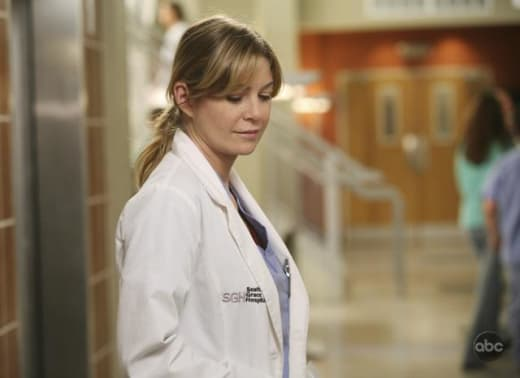 Should Meredith continue with therapy? iheartizzie: I'm not going to go all Tom Cruise and say there is no such thing as depression or mental illness, but at some point Mer has to sink or swim on her own. Therapy was great for Meredith but it's a first step, not a crutch. missingBurke: Definitely. Look what it's done for her already! She stood up to Derek at the end and he was wonderful about it. That is the kind of situation they will come across a million times in their new life together, and there's no going back. I thought the whole therapy angle was sort of overdone last season but there's no question it has helped her grow. McCritic: Not only should Meredith continue with therapy, she should cease to move forward with any activity that does not include therapy. Can we start a movement to christen her McTherapy? Meredith Grey is happy. Or at least she's telling herself that. Eat the muffin, Mer. Taste the muffin. Remember. The muffin. Permalink: Eat the muffin, Mer. Taste the muffin. Remember. The muffin. Cristina: There's no way that guy has been living at an 8. He's a wimp. His 8? My 3. I can take pain. Meredith: You can't talk to my boyfriend for 10 minutes. Cristina: Well there's pain and then there's torture.